As I mentioned before, I’m going to be blogging about Jerusalem this month – one letter per day. With such a subject, I’m rather spoilt for choice and can only show you a small part of the amazing number and variety of sites in this relatively small town. The Al Aqsa Mosque is the third holiest site in Sunni Islam. Its name means “the Farthest Mosque” and it originates from the year 705, although the building has been rebuilt and renovated several times since then. Miriam – you are amazing! This is going to be very interesting…would love to visit but the next best thing might be seeing what you choose to tell us about. Wow. It definitely stands out from it’s neighbours, doesn’t it? I should have made it clearer that Al Aqsa is the tall minaret. 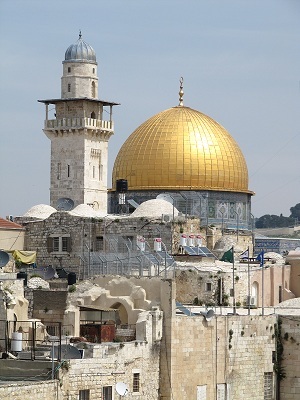 The golden dome belongs to the Dome of the Rock, which stands out very much. I’m going to enjoy these posts. As you know my brief visit to your City was far too brief and we didn’t get to see anything like what we planned to see so *sits back and puts feet up* I’m ready for the tour. I’m delighted to have you on board! That’s a lovely mosque. I’m looking forward to learning more about Jerusalem through your A to Z posts! Really interesting post! What a beautiful place – the roof, amazing! Very cool! Is that a balcony people can go out onto, or is it just for decoration? Hey spread the word theres ‘Judaism in Star Trek,’ because Leonard Nimoy says so and hes the man. Very cool! Jerusalem is on my long list of places to visit. I’m excited to see your posts this month.